Most people visit Vienna with a vivid image of the city in their minds: a monumental vision of Habsburg palaces, trotting white horses, old ladies in fur coats and mountains of fat cream cakes. And they're unlikely to be disappointed, for the city positively feeds off imperial nostalgia - High Baroque churches and aristocratic mansions pepper the Innere Stadt, monumental projects from the late nineteenth century line the Ringstrasse, and postcards of the Emperor Franz-Josef and his beautiful wife Elisabeth still sell by the sackful. The Ambassador Hotel enjoys a truly special location, on one side directly on the exquisite shopping street Kärntner Straße, on the other side on Neuer Markt with its historic characteristics. 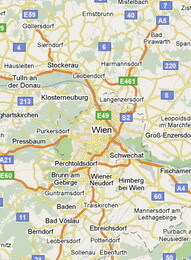 The State Opera, St. Stephen's Cathedral, the Imperial Palace and the Musikverein are in the immediate vicinity. All the rooms are very spacious and offer elegance with modern conveniences. The restaurant offers International and Austrian specialities which are served with traditional hospitality in a refined atmosphere. The hotel enjoys a fantastic location and is very highly recommended. 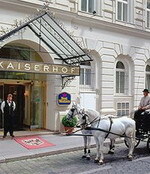 Located in the heart of Vienna, Best Western Hotel Kaiserhof is situated on a quite side street paved with cobblestones. 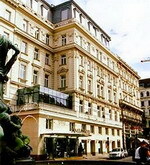 The hotel is only a stroll away from the State Opera House, the famous shopping streets, Kartnerstrasse and Marahilferstrasse as well as many museums. The hotel offers 76 air-conditioned guest rooms, well equipped with latest amenities. Featuring a health club, gymnasium and sauna, the hotel also provides conference and meeting facilities for its business travellers. Guests of the Best Western Premier Hotel Kaiserhof Wien enjoy a deluxe breakfast buffet featuring a traditional Viennese breakfast including Kipferl. The hotel is in a spectacular location, directly in the city centre, close to the pedestrian shopping area Kärntner Straße, opposite the Opera House and only a short walk away from St. Stephen’s Cathedral, the Hofburg Imperial Palace and the elegant Ringstraße, a road which boasts an impressive array of Vienna’s major sites, such as the Burgtheater Imperial Court Theatre and the City Hall. 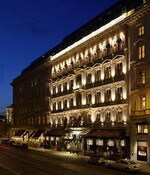 Indulge in an exquisite meal at one of the gourmet restaurants "Anna Sacher" and the "Rote Bar” at the Hotel Sacher Wien. The chef combines international and typically Viennese cuisine, light yet at the same time innovatively created, with the true flavour of first-class local basic ingredients first and foremost.